DCM London Gazette 27 September 1901. Believed to be one of approximately 12 D.C.M. 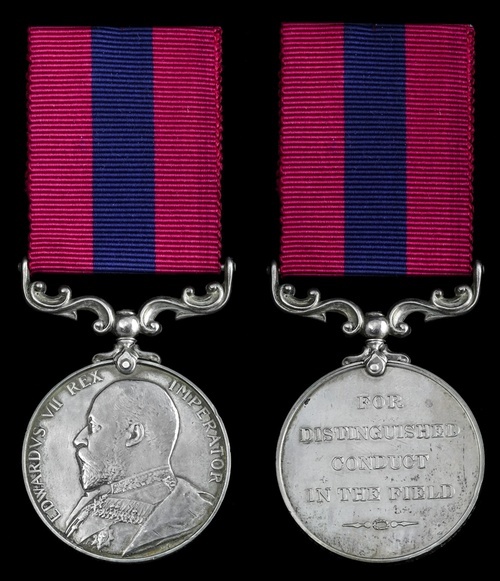 's awarded for the action at Sanna's Post. At first light on 31 March 1900, a large column of 2000 men under General Robert George Broadwood was subject to a vicious opportunity ambush by Boer troops led by General Christiaan de Wet and his brother Pieter Daniel de Wet. Having initially intended to capture the waterworks at Sanna's Post, 23 miles east of Bloemfontein, the enemy saw the chance of this far greater prize - which they grasped with both hands - deploying the first large-scale use of guerrilla tactics during the conflict. Utilising the cover of a deep spruit created by the Modder River, approximately 1600 Boers, supported by artillery from high ground, deployed in darkness and surprised the British, creating chaos amid a maelstrom of mauser-fire. As Broadwood's force began to withdraw from the main body of attack towards the direction of a ravine, a blocking force of 400 Boers held fire until large numbers of British troops lay squarely within their sights, entirely devoid of cover or any realistic opportunity to fight back without being slaughtered. Over 200 were forced to surrender in the first few minutes including six guns of 'U' Battery. Those stragglers to the rear of the captured main body faced the almost suicidal return towards the only cover available - a railway station - across 1300 yards of open ground. Within minutes, the Boers successfully captured over 100 wagons and a further artillery piece. The British began to retreat towards the station and it was amidst this apparently hopeless situation that the men of 'Q' Battery under Major Phipps-Hornby, joined by a single gun from 'U' Battery and the Mounted Infantry, decided to stand their ground and fight back. For four hours they fought continuously, aided by rifle fire from the railway station, and managed to transform a stampede into an orderly retreat. Those who managed to escape under the cover of British artillery were fortunate; had it not been for an eagle-eyed officer who noticed what was happening in the first few minutes and ordered 'Q' Battery to gallop away towards the railway buildings, the outcome may have been disastrous. Broadwood eventually managed to break contact and approximately three hours later the 9th Infantry Division commanded by Major General Sir Henry Colville arrived to relieve the Mounted Brigade. The element of surprise now lost, the Boers withdrew to highly defensive positions across the Modder River leaving a small garrison at the captured waterworks. The British forces, now low on ammunition, chose to retire from the field. In all, the British suffered 155 men killed or wounded with approximately 430 taken prisoner. The exact numbers vary by source, however what cannot be denied is the one-sided nature of the casualties. In his book Three Years' War, Christiaan de Wet noted his losses as 3 killed and 5 wounded. Had it not been for the desperate rearguard action of the British artillery, it is possible that British casualties may have been considerably higher. For the men of 'Q' Battery, it was a resounding example of bravery and professionalism, resulting in the award of 4 V.C. 's and 3 D.C.M. 's to the Battery, the former by ballot, there being no fair way to choose four from so many who performed so heroically on that day. This was the fifth case of the application of Clause 13 and the first since the conclusion of the Indian Mutiny. As a result, Major Edmund John Phipps-Hornby, Sergeant Charles Edward Haydon Parker, Gunner Isaac Lodge, and Driver Horace Henry Glasock were each awarded the Victoria Cross. Following the intervention of Queen Victoria, a further V.C. was awarded to Lieutenant Francis Aylmer Maxwell, 18th Bengal Lancers, attached Robert's Horse, for gallantry in assisting to save the guns. 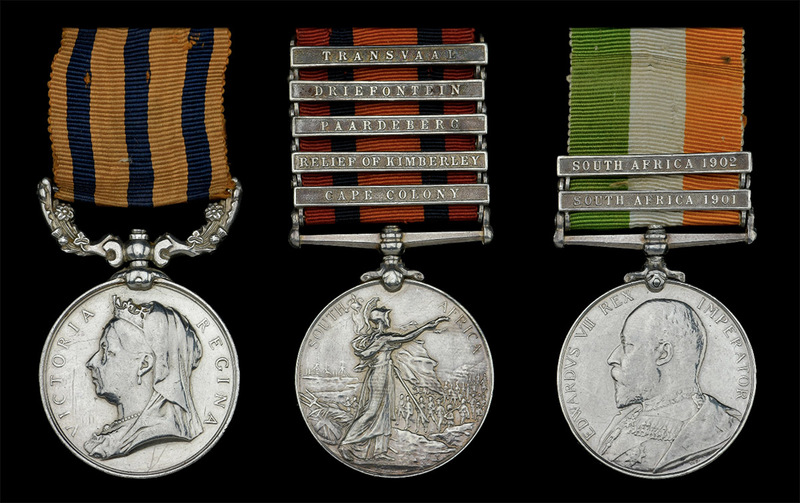 T. Murphy is one of seven men listed in the despatch from Brigadier-General Broadwood to the Military Secretary to the Field Marshall, Commanding-in-Chief, South Africa, Lord Roberts, on 20 April 1900, for 'risking their lives to save comrades under heavy fire'. Lieutenant Francis Aylmer Maxwell was awarded the Victoria Cross, whilst the others received the D.C.M. As the British camp was shelled from the east and rear at daybreak, Robert's Horse and 'U' Battery moved off on opposite sides of the baggage column which was clearing rapidly away from the shellfire and directly towards the deep spruit 'trap' set by the Boers. Engaging Robert's Horse from their concealed positions with accurate rifle fire, the Boers forced an initial retreat, but the mounted infantrymen rallied and made a splendid rear-guard stand, covering the retreat of the remaining guns, most notably those of 'Q' Battery. The Regiment suffered approximately 1 officer and 30 other ranks killed, 6 officers and 50 other ranks wounded, and 70 taken prisoner. Notwithstanding the losses at Sanna's Post, Robert's Horse was soon in action again, taking part in the operations under Generals French and Rundle for clearing the south-east of the Orange River Colony and effecting the relief of Wepener. 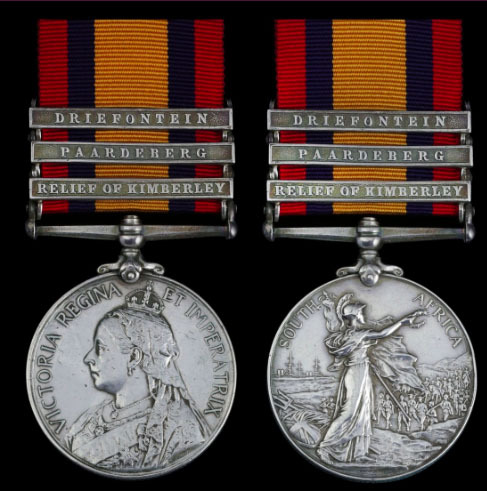 On 23 April, at Kariefontein near Leeuwkop, they were sharply engaged once more, suffering further casualties. Following the Sanna's Post action, Trooper Murphy was tried by Field General Court Martial for cattle stealing. He was found guilty and sentenced to 18 months imprisonment, forfeiting his Q.S.A. Medal. As a result, this D.C.M. would appear to be his sole medallic entitlement. John Dickson Hill was likely involved in the rearguard defence of 'Q' Battery at Sanna's Post where Robert's Horse fought with distinction. He was killed in action on 23 May 1915, aged 40, whilst serving with the 2nd Battalion, King Edward's Horse. The younger son of John Hill of Kirkliston, and husband of Daisy Dickson Hill of Bedford, he is commemorated on Le Touret Memorial.